One Novel and One Soon-To-Arrive Anthology! Woo Hoo! Hello Everyone! Lots of things happenin’ on the Higa homefront, and I finally got things under control enough to be able to reach out and get in touch with y’all! 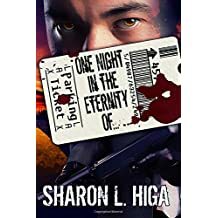 and it can be found under my name, Sharon L. Higa at Amazon.com! Full Moon Slaughter 2: Altered Beasts. Hope you all have a great rest-of-the-week! Read well, give reviews often, and until next time, don’t do anything I wouldn’t do! Hey Everyone! Crafter/Vendor/Author Family Event in Kingston, TN!!! Come on down!